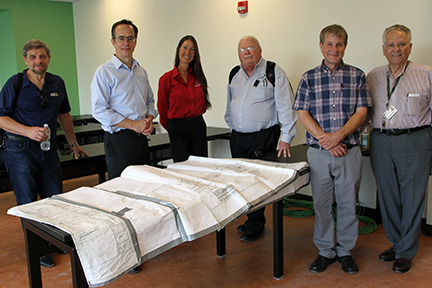 Mercer County Community College Professor Dom DeFino (right), coordinator of the Electronic Engineering Technology program, and Professor Jeff Weichert (second from right), coordinator of the Network Technology program, consult with representatives of the Security Industry Association during construction of the laboratory space for MCCC's new Security Systems Technology program on Mercer's James Kerney Campus in Trenton. SIA representatives, from left: Naum Schwartzman, AXIS Communications; instructor James Marcella, AXIS Communications; and Sherinda Barrow and Roscoe Coffman, Open Options. WEST WINDSOR – Mercer County Community College (MCCC) has announced the launch of an innovative experiential learning program for this spring, partnering with area businesses to integrate relevant job experience into a student’s course of study. To address that challenge, the college launched a partnership with Genesis Biotechnology Group (GBG), which offers Mercer students access to a Certificate of Proficiency as a Medical Office Assistant, while maintaining income through a paid internship for the entire one-year duration of the program. In addition, this partnership will guarantee employment with a GBG subsidiary for graduates who successfully complete the program. “I believe that if we can relieve students from their need to work at jobs that are not related to their studies while completing their AAS programs, we would enable them to study full-time and provide meaningful work experiences while earning academic credits, thus allowing them to graduate within the ideal two to three-year period,“ Wang said. MCCC is developing a similar partnership with Domain Computer Services of Cranbury, N.J., a technology solutions provider serving New Jersey and the New York metropolitan area. The partnership with Domain will provide short-term network cabling training and certification, which will lead to immediate workforce placement. MCCC is also designing a custom Network Engineering Technology degree program with Domain, one which will address market demand for certified information technology contractors and consultants. MCCC and Domain are currently customizing a program that will include paid field internships as a component of a product for small- and medium-sized businesses. In addition, MCCC and the Security Industry Association (SIA) are partnering to provide collaborative course instruction, internship placement, and career pathways for MCCC students enrolled in the college’s Security Systems Technology degree program. SIA provides full support for the lab equipment and instruction to provide students the most up-to-date technology and techniques from industry experts. The degree prepares students for employment in marketing, installation, management, and technical support for physical security systems technologies in an array of network environments. The first class began at Mercer’s James Kerney Campus during the fall 2016 semester. Wang noted that 63 percent of Mercer students in career programs study part-time due to the need to work, and that the experiential learning program can provide a clear path to guaranteed employment, provide income for students while they gain relevant job experience, and ultimately make them better prepared employees in the Mercer County workforce, and beyond.